Tuesday, April 7, 2015 from 6:00 p.m. until 8:00 p.m.
Charles Dennis Maroudas, 84, of Williamson died Sunday April 5, 2015 at St MaryÃ‚Â€Ã‚Â™s Medical Center in Huntington, WV. Charles was born May 18, 1930 in Williamson to Dennis and Vaseleke Bekairis Maroudas. Charles graduated from the University of Cincinnati in 1953 with a BBA in Business Administration. He was a member of Pi Kappa Alpha Fraternity. He met his future bride, Jeanne, when he gave a fraternity brother a ride home to Ashland, KY. In November 1953 he received an invitation to join the United States Air Force. After training he was assigned to Dover Air Force Base in Delaware. He served in the Air Force from 1954-1956 as a 1st Lieutenant. In January 1956 he became a buyer for Miners Memorial Hospital Association at the Williamson Field Office. Charles married Jeanne Maroudis June 10, 1956. He retired from Appalachian Regional Hospitals in 1976 as Vice President of Support Services and went to work full time at The Mans Shop, LTD which he opened with Pete Collins in October 1969. He retired again in April 1991 when he sold The ManÃ‚Â€Ã‚Â™s Shop. Charles served as President of the Chamber of Commerce, President of Kiwanis Club, Director of Main Street and as Chairman of the Board of Directors at the First National Bank in Williamson. He was a lifelong member of St. George Greek Orthodox Church in Huntington, WV. Charles will always be remembered for his outgoing personality, his service to his community and his love for his family. Visitation will be Tuesday, April 7, 2015, from 6 pm until Ã‚Â€Ã‚Â“ 8 pm, at Weaver Mortuary in West Williamson. The funeral will be held at 11 am Wednesday, April 8 at the mortuary. Fr. Mark Elliott of St George Greek Orthodox Church will officiate. Burial will follow at Mountain View Memory Gardens, WV. Charles is survived by his wife of 58 years, Jeanne, daughter and son-in-law Celia & Roger Lubbers, Bettendorf, IA and son and daughter-in-law Dennis & Shirley Maroudas, Forest Hills, KY. His grandchildren include Alexandra & Kristin Lubbers, Eleni & Charles Maroudas, Amber (Chris) Hatfield and great grandson Jacob Hatfield. He is also survived by his sister and brother-in-law Cleo and Bill Mathews, Hinton, WV and brother and sister-in-law Nick & Charlotte Maroudas, Williamson. Nieces and nephew include Stephanie (Joe) OÃƒÂ¢Ã‚Â€Ã‚Â™Keefe, Sylvia (Stephen) Burwell, Nicole (Tim) McNamee, and Robbie (Kelly) Maroudas. Great nieces and nephews are Jody & Keely OÃƒÂ¢Ã‚Â€Ã‚Â™Keefe, Helene & Matthew Burwell, and Nicholas, Noah, Benjamin & Clara McNamee. He was preceded in death by his parents Dennis and Vaseleke Maroudas. Family and friends who wish to offer a memorial may do so to St. George Greek Orthodox Church, 701 11th Avenue, Huntington, WV 25701. Weaver Mortuary of West Williamson is serving the Maroudas family. 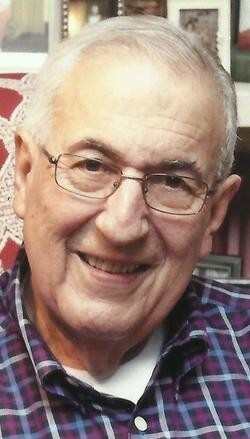 Charles Dennis Maroudas, 84, of Williamson, died Sun., April 5, 2015, at St Mary's Medical Center in Huntington, W.Va.
Charles graduated from the University of Cincinnati in 1953 with a BBA in Business Administration. He was a member of Pi Kappa Alpha Fraternity. He met his future bride, Jeanne, when he gave a fraternity brother a ride home to Ashland, Ky. In November 1953, he received an invitation to join the U.S. Air Force. After training, he was assigned to Dover Air Force Base in Delaware. He served in the Air Force from 1954-1956 as a 1st Lieutenant. In January 1956, he became a buyer for Miners Memorial Hospital Association at the Williamson Field Office. Charles married Jeanne Maroudis June 10, 1956. He retired from Appalachian Regional Hospitals in 1976 as Vice President of Support Services and went to work full time at The Man's Shop LTD which he opened with Pete Collins in October 1969. He retired again in April 1991 when he sold The Man's Shop. Charles served as president of the Chamber of Commerce, president of Kiwanis Club, director of Main Street and as Chairman of the Board of Directors at the First National Bank in Williamson. He was a lifelong member of St. George Greek Orthodox Church in Huntington, W.Va.
Visitation will be Tues., April 7, from 6-8 p.m. at Weaver Mortuary. The funeral will be held at 11 a.m. Wed., April 8, at the mortuary. Fr. Mark Elliott of St George Greek Orthodox Church will officiate. Burial will follow at Mountain View Memory Gardens at Maher, W.Va. Charles is survived by his wife of 58 years, Jeanne; daughter and son-in-law, Celia and Roger Lubbers of Bettendorf, Iowa, and son and daughter-in-law, Dennis and Shirley Maroudas of Forest Hills, Ky. His grandchildren include Alexandra and Kristin Lubbers, Eleni and Charles Maroudas, and Amber (Chris) Hatfield, and great-grandson, Jacob Hatfield. He is also survived by his sister and brother-in-law, Cleo and Bill Mathews of Hinton, W.Va., and brother and sister-in-law, Nick and Charlotte Maroudas of Williamson. Nieces and nephew include Stephanie (Joe) O'Keefe, Sylvia (Stephen) Burwell, Nicole (Tim) McNamee, and Robbie (Kelly) Maroudas. Great-nieces and nephews are Jody and Keely O'Keefe, Helene and Matthew Burwell, and Nicholas, Noah, Benjamin and Clara McNamee. He was preceded in death by his parents, Dennis and Vaseleke Maroudas. Family and friends who wish to offer a memorial may do so to St. George Greek Orthodox Church, 701 11th Avenue, Huntington, WV 25701.